University of Toronto Humanist Chaplaincy: HAT MONTHLY MEETING: Sat. Nov 9, 1:30pm "Natural Burial"
HAT MONTHLY MEETING: Sat. 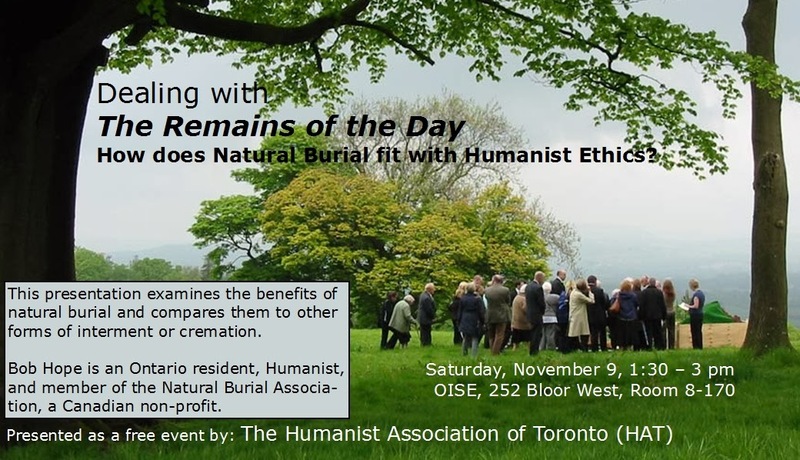 Nov 9, 1:30pm "Natural Burial"
Natural Burial is a “new” old concept of burial. In 2008, Victoria BC was the first city in Canada to offer it as a choice and interest has been growing since. Natural burial methods are designed to return the body to the earth without inhibiting the natural process of decomposition, leading to a sustainable burial process with little environmental impact. Different from conventional cemeteries, a natural burial site (also known as a woodland cemetery) is managed for the benefit of wildlife and is planted to encourage a diverse range of flora and fauna. In this way, natural burial grounds actively contribute to the protection and creation of forests and parklands. Bob Hope is an Owen Sound, Ontario resident and member of the Natural Burial Association, a Canadian non-profit organization. Bob has studied the issues of conventional burial and cremation as well as the benefits of natural burial when compared to other forms of interment or cremation. This presentation concludes that it is time for Natural Burial to become an important alternative choice for environmentally conscious citizens.